And here we are again with our regular look at the most serious assualt to have taken place in town! Now New York New York, so good…managed to go a full 24hrs on Wednesday without a murder or stabbing which was something of a rarity we gather and must be a good advert for the tourist trade but dear old Bedford wasn’t as lucky as some poor unfortunate was on the end of an unprovoked “duffing up” over on Warwick Avenue. As usual the Police would like to hear from you if you saw anything and don’t mind standing up in court to point at whoever gets blamed for it! Anyway as its Cllr Collen Atkins and Cllr Louise Kings council ward it’ll give them something to be concerned about! Bedford has a new tourist attraction. Anyone wanting to glimpse how Nelson Mandela got through his incarceration on Robben Island, anyone who wants to get into the mind of Terry Waite handcuffed to a radiator for five years, or taking a lighter approach appreciating the living hell of a classically trained actor who ends up on Coronation St for eternity well go no further. To immerse yourself in this purgatory, this mind numbing existence simply head into Bedford from Tavistock Street at roughly 5.30pm any weekday and try heading down the High Street past the college with the vague intention of getting to London Road and see how long it takes. Marvel at the Christmas lights, savour the blue twinkly strands as you sit there with no movement. Wonder at how the car in front moves at the speed of glacial shift only to be thwarted in a desperate bid for freedom by another queue of traffic coming from Mill St and screwing things up. Marvel at the Christmas lights. The same bloody strand of blue bulbs that you have been looking at for the last ten minutes. You have fallen in love with a showroom dummy in the big Debenhams window, it’s a whirlwind affair, the best sort of love, it rejuvenates, you marry, travel the globe, live life and dance under the moon but it all fizzles out, you go your separate ways, you move forward by a metre or two and your broken hearted manikin resumes their position in the shop window. You both shed a tear. You’re outside the amusement arcade and its twenty minutes since you got in your car several hundred yards away. Close your eyes and you’re on stage with VNV Nation singing along, the audience call for more, really giving it some, a horn sounds and you jolt back into the nightmare, the people on the bus are looking at you, not so much bemused, more grateful for the entertainment value of someone with eyes closed having a reasonable time and singing which eclipses the Christmas baubles. As far as they know, you might have been on your mobile phone and singing a goodnight to the kids, technology has made schizophrenia so much more acceptable! You realise that a zombie apocalypse like in last night’s Dawn of the Dead film has happened down at Rope Walk and that this traffic jam isn’t going to end happily but with the undead gnawing at your throat which might be preferable to that gnawing sensation of your life slipping by as you look out of the window and see you manikin lover flirting with someone else. Men..Bastards! Half an hour and you can see the Market Square. And about a hundred cars all stuck in the same temporal time loop that must have been opened by archaeologists working in the tunnels under what’s left of Bedford Castle. You are now on life support, some inner strength is keeping you going, that hope, the same feeling that sustained Mandela and the cast of Last of the Summer Wine. You’d eat a live rat, you’d consider one of those piss awful sausages from the Bedford Swan Hotel. Then things take a turn for the worse, each car door opens and Mary Portas steps out from every stationary vehicle. Like an Agent Smith of the retail advisory dimension. Look use your imagination, I am. Mary times 150 surround you, laughing like banshees, you scream, clench your eyes, your fist, your soul, eyes open and ……the Mary’s have gone back in to the recesses of your bored mind, but your physical form that dances on the earth for a short while hasn’t moved a bit. Your dreams may toss and turn! The town’s homeless sit on the steps of the statue. You dream of fresh air, so do they! The river looks so beautiful. The moon has fallen in and rests on the surface, the green lights give the trees a soft radiance of sentient spirit. But you can’t see it as you’re stuck in your own little break in the time space continuum. A Police box appears at the side of you, a man emerges, knocks on your window, beams at you and says “It’s me I told you I’d return to…er..….oh sorry I thought you someone else” He grins apologetically and the blue box vanishes into mist. You actually see the river but by this time you’ve lost the will to live and have sampled the delights of a persistent vegetative state. Compulsory euthanasia seems a natty option. 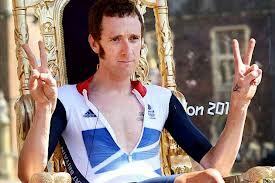 It’s there in front of you, forget Mandela and Waite, you are now in your own personal Olympics. The three hundred metre crawl to the Ampthill Rd roundabout. It’s yours for the taking, Gold Silver Bronze but at the last two hundred yards disaster strikes as the bus in front of you stops outside the Serino flooring shop, people shuffle on, slowly, so slowly. Miss three turns, go down the snake, do not pass go, spend a night in Jail, you’re fired! Eddie Mair on Radio Four says goodnight and off he goes into the swirling fog and musty stench of 1800s London. The time that is, not the year. Meanwhile time has become an abstract concept as you eventually near the end of the journey. The car, automatic for the people, moves into second gear and shares my relief at meaningful motion. Elderly ladies distribute food and comfort to those who didn’t make it intact. Hazard lights like heartbeats. Ghostly spirits can be seen in the gloom watching this spectacle of four lanes of cars all trying to beat each other and all suffering in the process. You enter into third gear, retune the radio and spend the remainder of the journey home listening to a programme last heard in 1962 and still presumably haunting the airwaves. 1962, the year I was born, the year I started this short trip of many a mile! Getting a lot of hits today and I think its because Bedford is seriously close to getting flooded and its threatening the Bedford Bypass so I’ve figured that if I load this blog with flood warning and Bedford Bypass under water and Bedford Bypass sinks (the road one not us) and so on we might do quite well but when people see / read the feeble gumph that we’ve put on it might be short lived! Go on Skip if you must! Hi Skip Hunters, its Skip here bright and early on a Monday. I’ve said before that council recycling skips are a good source of pillage and as councils support re-use they leave most of them open for skip hunters to plunder them for booty and we sure make the most of the opportunity to support the council! Yes! This weekends “find” was a shed load, or a reasonably sized dog kennel load of high quality toys, clean and in need of love. Problem is some knob thought it a good idea to leave them in a small skip full of stinky food cans and milk bottles. I was on my bike and just in time although I’d gone looking for reading material for prisoners as part of an on-going Now or Never magazine project and wasn’t in a position to cycle off with these cuddly fella’s but ever since I hooked up with the Bedford Bypass team help isn’t that far behind and Gill McC came to my aid to help save these little characters! 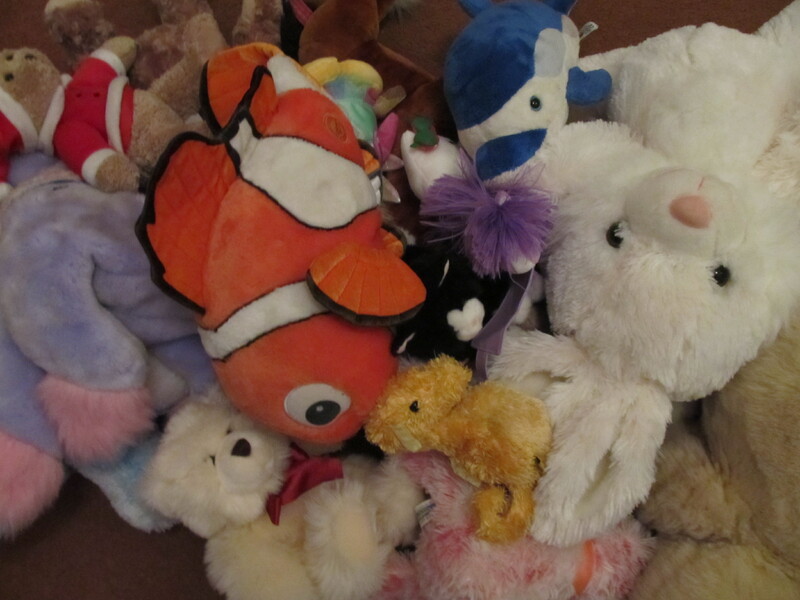 Now since I’ve joined Bedford’s worst group of anarchists I’m getting into reading Prouhdon , Bakunin and the underlying concept of mutual aid but that doesn’t help me decide what to do with a big bag of soft cuddly toys including Nemo the fish (bigger than the film version). A bit of mulling it over and Gill points to a sign telling passers by that there’s a Christmas Fair on at the Multiple Sclerosis Day Centre on Barkers Lane. And just like in those Christmas films where everything turns out all right Bedford Bypass helps fill the Soft Toy Tombola table at the fair. Nemo is seen going out under a liitle boys arm. The purple My Little Pony went quite quickly as did a Unicorn and it was all fun fun fun! Note from Gill: We go to the MS Centre several times a year to spend a few quid. It provides a day “drop in centre” with therapy facilities and is entirely self-funding! It’s one of the few places where you actually barter the price up i.e. 50p is too low for a double Trance Nation CD so I insisted on £1.00. Its that sort of place. I wouldn’t have minded having Nemo for myself though! Fair do’s, Bedford Borough Council know how to put on a good do and to welcome HMV back to town for just over a month with their cash in “pop up” shop there was a fireworks spectacular on Wednesday evening. As ever the event which celebrates an attempt by Father Christmas to blow up the houses of parliament was marked by some seriously large rockets and sonic booms, Chinese glowing light sticks for sale made in sweat shops , people selling donuts and the Swan Hotel jumping on the bandwagon by selling what looked to be a hog roast. Now sorry to be a bore (ha!) after the seriously lousy food we had there some time back we walked straight past! Special guest star apart from Father Christmas doing his “ho ho ho!” thing on the Suspenders Bridge was none other than Olympic cycling hero Ettiene Stott although we only know this because it says so in the paper. There was no sign of him or his trademark sideburns on the night! Given that the event itself is supposed to mark the switching on of the Xmas lights in town you don’t actually get to see them come on as you are about a quarter of a mile from the High St and unless you walk back into town you won’t get chance to look at Bedford twinkling with pride as once again Bedford has the chance to buy cut price CDs from Take That, Subo and some band called Wand Erection if I’ve heard that right. Still it was a good night! Debs was all starry eyed at Skip (Hunter) as he went through the bins and we all piled into the coffee shop on Castle Lane! Given that the fireworks are so good people come from miles around to support the event, even from well beyond Bedford. I asked someone if he’d be saying thanks by doing a bit of shopping in town and he’s said “Don’t be stupid”. So here it is and it’s only just begun! Thank you your humble scrumptiousness! 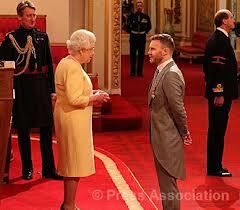 Unbelievable, Gary Barlow from pop group Stitch That receives his OBE from Madge this morning and within the hour she’s got him in her private plane and pushes him out over the Gaza Strip where almost as soon as he lands, Hammas fighters and the Israeli army so overjoyed at him parachuting into the bomb scarred landscape are playing each other at football in no man’s land and crooning along the Gary’s hit songs like Angels, Leader of the Gang and that other one that’s sort of catchy in an odd way. I’ve always been a bit scathing of boy bands but I have to hand it to Gary he’s pulled of a coup by bringing peace to this part of the middle east! The Swan Hotel Bedford yet again! Seems easy to get publicity these days providing the press don’t ask too many questions. Dominic Mills is the manager of the Swan Hotel in Bedford. You might recall that several of us went to this place in June for a do and ended up trying to raise a few issues with Millsy as to a minor accident out in the car park, misleading info about the CCTV system in use and awful overpriced food. 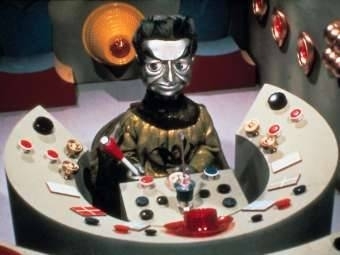 Millsy refused to return phone calls or reply to emails. Now The Swan have been in the local papers supporting the poppy appeal as they are keen to support limbless soldiers which I find at odds with their decision to charge people attending a Help for Heroes event last February £3.00 to use their car park. 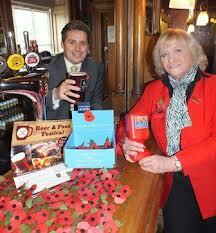 Dominic has also been publicising a recent Beer and Food Festival on the back of the poppy appeal and appears to be drinking whilst at work and posing next to the poppy box. I can only hope the food is of a better quality than that served up to us last June or that dished up at the Learning Partnerships Christmas party. 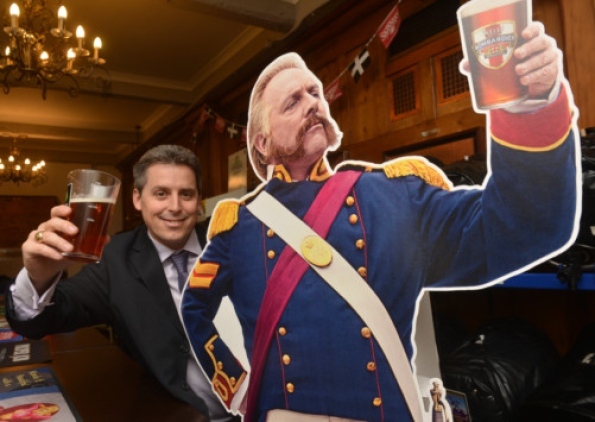 The choice of beer being supported at the festival is also a bit disappointing as Dominic has opted to sample a pint of Charles Wells bitter and enjoy another pint whilst standing starstuck by a cardboard cut-out of unfunny has been Rik Mayall who is now doing commercials for Wells. To busy with Rik to bother getting in touch! Now I don’t mind Wells bitter, I much prefer it to Greene King but most of the pubs in town sell it and its mass produced. With so many alternative micro-breweries needing support round here it’s like going to a cheese and wine tasting and being given Blue Nun and those triangle things. Now given Dominic’s refusal to speak to me I have happily been advising no end of people as to our perceived lack of quality from the Swan Hotel at Bedford to the point where I gather he’s banned me from attending further events there and as of today he’s still far too busy to speak to me! I did spot him a few weeks back as me and Debs popped into see his beer festival though as soon as we got a flavour for things we cleared off to The Bear pub for a game of pool. Here’s to more Bedford Swan related coverage over the coming months! You may be aware that Bedford Bypass operates on a number of levels. Apart from the blog there’s a loose network of networking going on i.e. 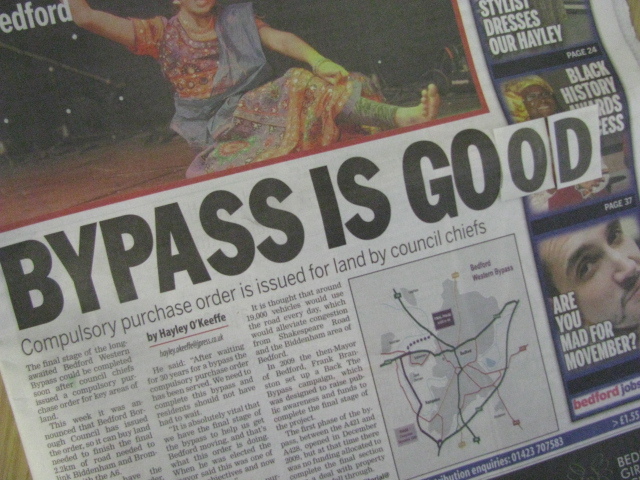 advice to people that need a leg up, how to use the Freedom of Information Act etc, pointing people in the right direction and we’ve done quite well on this front but for the most part we keep shtum as it’s nice to see responses from the Borough Council to letters from us but in the names of others. All very polite! Then there’s an ongoing series of letters to the local paper that I started writing almost 20 year ago! Quite vociferously however of late some of them don’t make it into print! Getting familiar with cutting and pasting! I’ve put one in to the Times and Citizen today about local MP Nadine Dorries who is in the jungle being a celebrity. I’m neutral about the merits of her being there and to be frank I don’t give a toss what she’s up to but what I have pointed out is that for anything up to a month those in her constituency of Mid Beds have the privilege of seeing exactly what their MP is up to which is more than I can say for where I live as Alistair Burt don’t tell us anything accept for when he wants the masses to vote for him! Mr Burt seems to have become a war correspondent lately and keeps turning up talking about overseas affairs and as Nadine pointed out he’s become quite adept at vanishing off to warmer climates and I can’t argue with that! What I can say is that Nadine Dorries is no advocate of advancing democracy and no one should be under any illusions despite her beetle eating antics and wanting to connect with common people that she is in every way a shining example of an MP and is no different from the rest of them. She’s hired a certain Jennifer Dorries as her senior secretary and before this bit of nepotism she hired someone called Philippa Dorries on a reported bung of £35,000 equivalent although Phillipa now works for a law firm. Cassie Dorries, the youngest of the brood meanwhile runs her mum’s twitter account. Who exactly is paying for this! Oooh! He reminds me of someone! 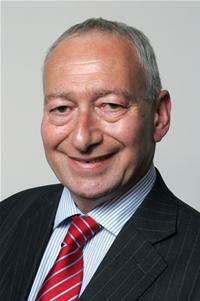 You know that David Sawyer bloke, the Lib Dem off the Borough Council, him that got over £22,000 grand in allowances, well he doesn’t half remind me of someone, I just can’t place it though, so familiar. I’m sure it’ll come to me at some stage! I’d like to apologise for the very low quality of blogging on today’s Bedford Bypass. It really is dire rubbish. Bloody awful to be frank.